Visitors to the Techno Classica show in Germany this weekend were treated to the spectacle of all manner of classic cars under the roof of the Messe Essen. Not surprisingly, the Volkswagen Group was well represented, with the historical departments of two of its flagship marques showcasing their in-house restoration projects – albeit in radically different states of repair. While Porsche brought a completely restored example of a particularly storied 911, Lamborghini went the opposite route by displaying the bare body-in-white for a Miura. With the Miura now celebrating its 50th anniversary, Lamborghini's recently launched PoloStorico division is in the process of restoring several examples. 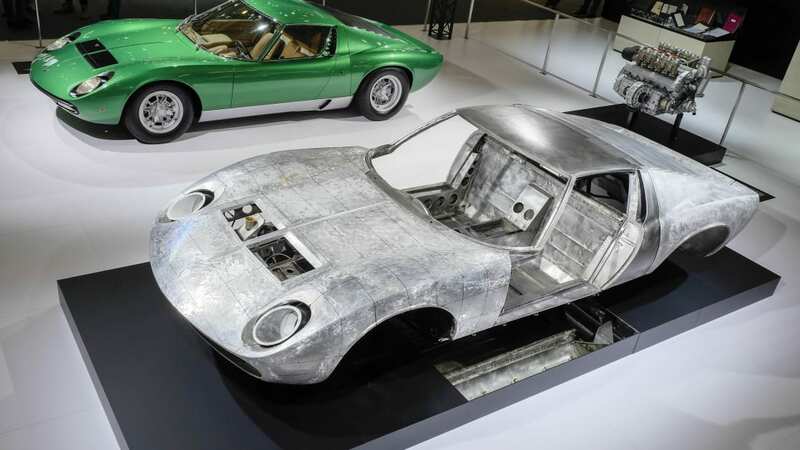 Chassis #5030 is a Miura SV that, as you can see, is still in the middle of its refurbishment, its frame corrected but still unfinished – but that didn't stop the Raging Bull marque from putting it on display. It was joined by the freshly completed green example (chassis #4846) that was the department's first project, as well as the engine from a Miura P400S. Meanwhile, Porsche Classic arrived with a lovely 911 2.5 S/T, the precursor of the 911 RSR. One of only 24 examples made, this particular vehicle won its class at Le Mans in 1972 at the hands of works driver Jürgen Barth (who would alter claim victory overall in '77). It was rediscovered in poor health decades later by a collector, who commissioned Porsche Classic to bring it back to life. The task proved monumental, the vehicle having been modified, crashed, rusted, and used as a playground for children. Both vehicles aptly demonstrate the kind of care that these manufacturers' own restoration departments put into preserving their company's legacy. If you weren't in Essen this weekend to see them first-hand, you can check them both out in the pair of image galleries. Lamborghini PoloStorico is at Techno Classica in Essen, 6-10 April 2016, celebrating the Miura's 50th anniversary and illustrating its scope of expertise in restoring classic Lamborghini models. 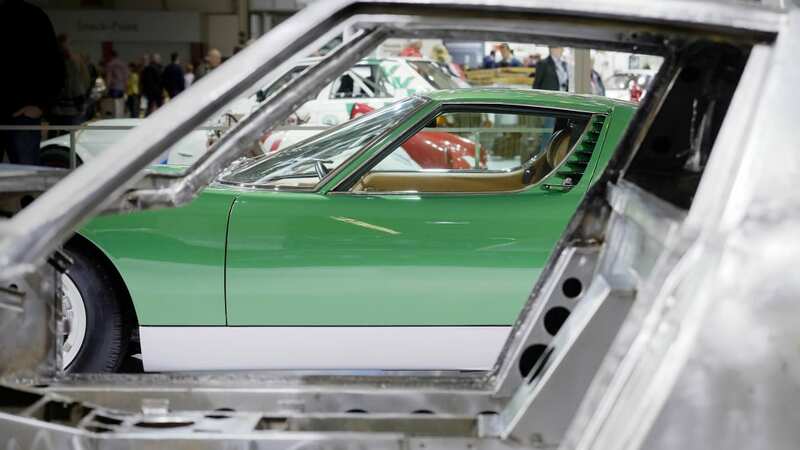 Showing the original Miura SV first unveiled at the 1971 Geneva Motor Show and the subject of a full restoration by Lamborghini PoloStorico, the stand also displays a Miura chassis demonstrating work in progress and a fully overhauled Miura engine. 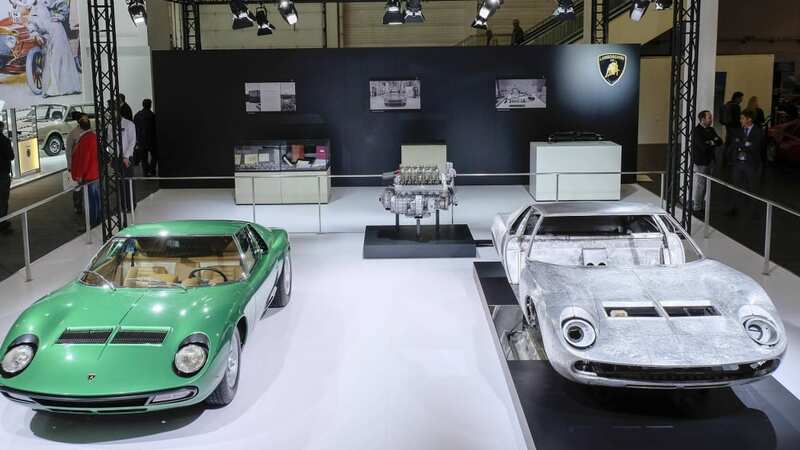 "Techno Classica is the ideal forum at which to demonstrate the restoration expertise of Lamborghini PoloStorico," said Enrico Maffeo, Head of PoloStorico. "Since PoloStorico's official launch a year ago, a number of important restorations have already been commissioned including the first Miura SV chassis #4846, as well as our ongoing work in archiving, certification and management of spare parts for classic Lamborghini models." The original Lamborghini Miura SV, chassis #4846 is the pre-production model for subsequent Miura SV models, and was unveiled at the 1971 Geneva Motor Show on Bertone's stand (while Lamborghini showed its new Countach LP 500). The car was truly a one-off, carrying over parts from the previous Miura S and introducing new features that would be seen on later SVs. Lamborghini PoloStorico was appointed to fully restore chassis #4846 to its perfect original state. The subject of exhaustive research, each detail of the Geneva show car has been respected rather than adopting later production SV parts. Also on display is a part-restored Miura SV chassis # 5030. The body in white demonstrates a chassis' restoration by Automobili Lamborghini Polo Storico. Drawing on the references and expertise available from Lamborghini PoloStorico's archives including production sheets, technical references and imaging scans of Miura chassis, the frame was corrected on a jig while the body panels were restored to their original lines and shapes. The chassis is now ready for anti-rust treatment and subsequently for pre-coating prior to paint. 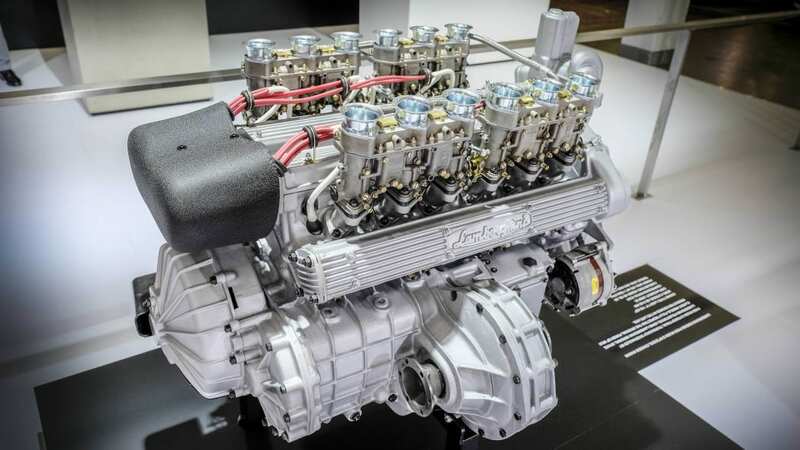 A Lamborghini Miura P400S engine, no. 30563 from chassis #4644 is on display following a thorough overhaul by Lamborghini PoloStorico, using original classic spare parts to fully respect the original finish of Miura production engines in the late '60s. Lamborghini PoloStorico officially opened in spring 2015, supporting historic models and Lamborghini's heritage through four main areas: restoration of historic Lamborghini models; archive management; original Lamborghini spare parts for which around 70% of the historic car park is covered; and official certification of Lamborghini historic cars. Stuttgart/Essen. To mark the opening of Techno Classica in Essen, Porsche Classic presents a restored 911 2.5 S/T with an eventful motorsport history. The class winner at Le Mans in 1972 has been restored by the Porsche Classic experts over the past two years and will now be presented for the first time at the fair. Alexander Fabig, head of Porsche Classic at Porsche AG, recalls the state that the car was originally in: "The 911 2.5 S/T was rediscovered a few years ago by a collector in the USA – and it was in a rally dilapidated condition. Our experts have done an excellent job at restoring the sports car to the highest standards." The find is a real rarity: only 24 of this racing car, based on the 911 2.4 S Coupé, were ever built. "We are thrilled about the confidence this customer placed in us with this restoration job. This project is unparalleled and of great historical significance", Fabig continues. The 911 2.5 S/T was developed for customer sporting use in group 3 (series GT vehicles) and group 4 (modified GT vehicles) and was available in limited numbers from the sports division of what was then Dr. Ing. h.c. F. Porsche KG for 49,680 Marks from the end of 1971 onwards. The 911 2.5 S was a works-modified version of the standard 911 2.4 S Coupé designed for use on racing circuits such as the Targa Florio or Le Mans as well as in rally racing, costing an extra 19,000 Marks, modified strictly in accordance with the international sporting regulations. 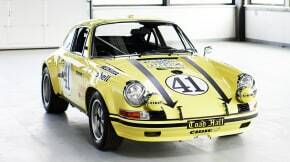 Ordered from the sports division of Porsche by the US racing driver Michael "Mike" Keyser in November 1971, the 911 2.5 S/T saw action at several races in the USA and at the endurance world championship during the 1972 season. One of the drivers back then was Jürgen Barth, a Porsche factory driver and an employee of the sports division of Porsche. The overall winner of the Le Mans 24 Hours race in 1977 can still vividly remember those days even now, 44 years later: "Mike Keyser had invited me to Sebring and we planned to drive the full 1972 endurance championship. Mike had even hired a small TV team to accompany us through the season." In the 1972 season, Jürgen Barth and the 911 2.5 S/T raced in the Daytona 6 Hours and the Sebring 12 Hours in Florida, followed by the Targa Florio as well as the 1000-km race on the Nürburgring together with Mike Keyser. Together with Sylvain Garant from Switzerland, Keyser and Barth finally took up the gauntlet of the season's highlight – the 24 Hours of Le Mans. Not only did the trio, under the banner of the team Louis Mezanarie, take the class victory for GT cars up to 3 litres, but also clinched a formidable 13th place overall. All these years later, the restoration is posing a real challenge for the Porsche Classic experts – especially when it comes to the bodywork. As soon as the car had arrived at the workshop the experts discovered that not only had the 911 been converted to what was later dubbed the 'G-model', but it had also suffered accident damage, which had been bent back into shape unprofessionally. In addition to deformation in the tunnel as well as on the side rails, corrosion had done serious damage, in particular in the wheel housing panels, the tunnel and the roof. The roof, which had been deformed beyond repair, suggested that children had used the car as a welcome playmate for a considerable length of time, making the repairs to the bodywork particularly complex, which included the challenging conversion and reconstruction of the flared wing extensions, partly done by hand. The 911 2.5 S/T was given a new roof as well as new tank bottom. After the extensive metalwork had been completed, the body of the 911 2.5 S/T was coated by cathodic dip painting (CDP) to protect it long-term against corrosion according to the highest technological standards of series production. This was done by putting the restored body through the current series production process at Porsche to give it perfect protection against corrosion. This was then followed by body finishing and painting in the original light yellow colour, code 117. Motor racing, in particular the Le Mans 24 Hours race, is of great significance to Porsche. Over 800 Porsche vehicles have taken part since the first race took place in 1951, with 103 of them taking a class victory and 17 overall victories at the circuit on the river Sarthe, Porsche is the most successful brand there by far. After winning last year, Porsche is all set to take part in the 84th Le Mans 24 Hours race on June 18 and 19 this year. Traditionally for Porsche, a race like the 24 Hours of Le Mans is not only about competing at the highest level. Rather, the race track is more of a testing ground for new technologies. The development of successful race cars like the 919 Hybrid and the 911 RSR as well as being put to the test under tough racing conditions offer critical insights that can be incorporated in to the design of future generations of production models. This type of technology transfer from race car to standard vehicle as the driving force behind Porsche's motorsport involvement was already in Ferry Porsche's mind when he said: "Technical progress is unthinkable without sport. It is the vector for development. The extreme demands we face on the race track very quickly highlight any weak points and encourage our engineers to look for new and better solutions." Seen in this light, the 911 2.5 S/T restored by Porsche Classic down to the last detail can be see from a historical point of view, too. It was the direct predecessor and the immediate technical precursor for the 911 Carrera 2.8 RSR, which saw the abbreviation "RSR", which stands for RennSport Rennwagen (literally: racing sport racing car) become the epitome for the highest stage of development of the 911 racing cars from 1973 onwards and heralded the continuous technological improvement of the production 911, in keeping with Ferry Porsche's philosophy. Having now been on the market for over five decades, the 911 – which is now in its seventh generation – stands for the Porsche brand like no other series. Porsche Classic is now already taking care of the fifth generation of this iconic sports car (Type 996). The Classic experts cater for all vehicle model series whose production was phased out at least ten years ago, in order to continue to guarantee smooth service and assure long life and value preservation for classic Porsche vehicles.